This map shows fireballs occurring around the world from 1994 to 2013. The sizes of orange dots (daytime impacts) and blue dots (nighttime impacts) are proportional to the energy of the impacts, measured in billions of Joules. Fireballs caused by disintregrating asteroids streak through Earth's skies at least twice per month on average, scientists say. 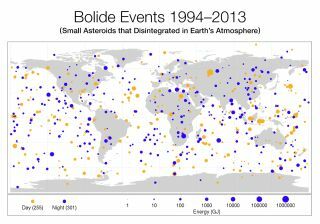 A new map created by NASA researchers documents 556 fireball events — produced when small asteroids explode in Earth's atmosphere — that occurred around the world between 1994 and 2013. Fireballs, also known as bolides, are defined as meteors that blaze at least as brightly as the planet Venus in the sky. Scientists compiled the new map using data collected by U.S. government sensors. That database is more complete than others previously available to NEO researchers, but it does not include every single fireball that blazed up over the last two decades, NASA officials said in the statement. So the actual number is higher than the 556 depicted on the map. The map also charts the energy released by each fireball. The most powerful of all was the Russian meteor explosion, which occurred in February 2013 when a 65-foot-wide (20 meters) space rock detonated over the city of Chelyabinsk, injuring more than 1,200 people. The Chelyabinsk explosion released the equivalent of about 500 kilotons of TNT, researchers said, making it about 30 times more powerful than the atomic bomb the United States dropped on the Japanese city of Hiroshima during World War II. While the new fireball map chronicles the impact of space rocks just 3 to 65 feet (1 to 20 m) wide, it should also help researchers extrapolate to get a better handle on the population of big, potentially dangerous asteroids whizzing near the planet, Johnson said. That population is large. Scientists think there are about 1,000 potential "civilization-enders" at least 0.6 miles (1 kilometer) wide out there. NASA's NEO Observations Program has already spotted about 96 percent of these mountain-size space rocks, and none of them pose a threat for the foreseeable future. But there may be about 25,000 near-Earth asteroids at least 460 feet (140 m) in diameter, which could cause massive destruction on a local scale if they hit the planet. And many of them are cruising undiscovered through space. Indeed, scientists have found just over 11,600 near-Earth asteroids of all sizes to date; the entire population likely numbers in the millions. Objects too small to generate fireballs hit Earth incredibly frequently. About 100 tons of sand- or dust-size particles rain down on the planet from outer space every day, scientists say.